On the right of this page are links to three categories of important educational information organised by anatomical site for Mr Hardy's Patients, Staff, and Delegates on the Orthopaedics and Trauma courses he teaches on. 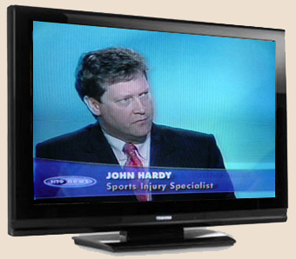 Mr Hardy has 35 years educational experience of teaching Patients, Medical Students, Nursing Staff, Physiotherapists, Doctors and Trainee Surgeons. He has appeared in documentaries, BBC and ITV news programs and newspaper and magazine articles. For more information on Mr Hardy's educational, research and clinical experience please read his curriculum vitae. Mr Hardy is currently working on a teaching video with George Davies (Next, Asda, Per Una) the owner of the Design Agency Red Creative. A picture is worth a thousand words. Mr Hardy uses anatomical plastic models in clinic and for patients, trainees, colleagues and staff interested in the more common conditions. Mr Hardy uses video clips of procedures he has carried out in the past to illustrate the aetiology and cure of common conditions. The video clip on the right is of a keyhole procedure on the knee. In this video Mr Hardy is smoothing the delicate surface of a knee cap in a patient with pain and creaking when getting out of a chair or climbing or descending stairs. In each page accessed buy the hyperlinks to the right are some patient information sheets. When you click on an icon of a sheet a .pdf file opens for printing or saving to your own desktop. These Surgical Protocols, like the carpal tunnel decompression protocol on the left, may be accessed by the theatre staff Mr Hardy works with below the tabbed box on each page by anatomical site. Mr Hardy recommends the WHO "Safe Surgery Saves Lives" standard and these Surgical Protocols help his team to comply with this guideline. WAD is a common condition of the. Cervical Spine. Only use neck braces on the advice of a GMC registered doctor. There are a number of information sheets on conditions affecting the many joints and ligaments around the shoulder. Joints covered in this section include the Acromio-clavicular Joint; Subacromial Bursa; Glenohumeral Joint Shoulder Tendonitis and the use of Shoulder Braces and Supports. Click on the image on the right to open a pdf about Trigger Finger. Painful knees are not normal knees Click on this link for a glossary and advice sheets. Painful Knee. There are information sheets in this section on Shin Splints; Stress Fractures; Periosteal Syndrome; Compartment Syndrome and the use of Aircast Leg Braces. John is a world expert on coccydynia. There are information sheets in this section on the red flags for Coccydynia, Acute Low Back Pain; the use of Lumbar Braces and Supports.